Ogun State Polytechnic Post-UTME screening form has been released. We updated this post yesterday when the form first appeared on the school’s website. Ogunpoly has also published an official statement confirming the release of the form. 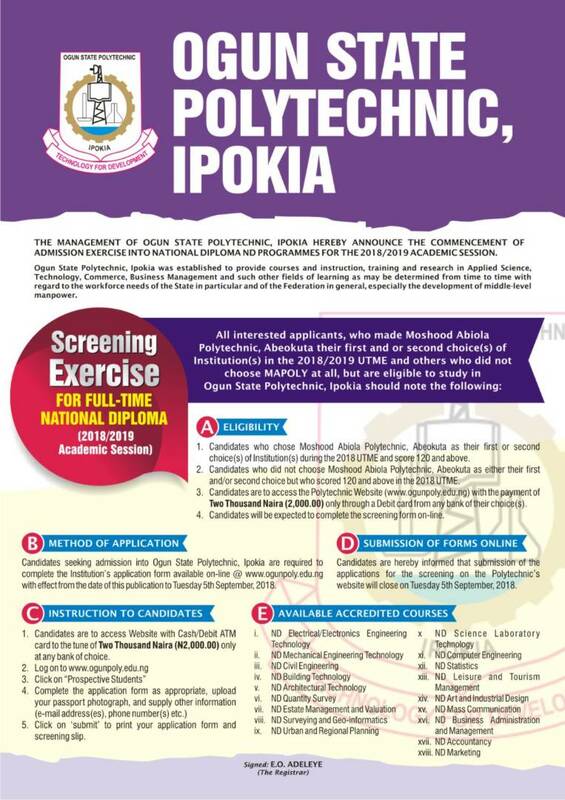 Continue reading to see how to apply for Ogunpoly Post-UTME screening form. All candidates that chose Moshood Abiola Polytechnic, Abeokuta in the 2018/2019 UTME exams and obtained a minimum score of 120. Candidates must also have the required O’level subjects and JAMB subject combination. Others who did not choose the Polytechnic but must have also scored 120 and above in the UTME can still apply. 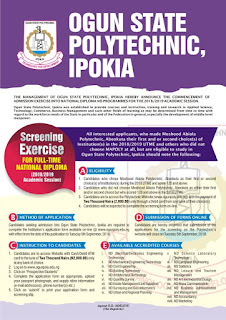 Interested candidates are to visit the Polytechnic’s website on www.ogunpoly.edu.ng for available courses and other necessary requirements for the screening exercise which will close on Tuesday, 5th September, 2018. From the above, Ogun poly, Ipokia cut-off mark is 120. Candidates who have chosen Moshood Abiola Polytechnic, Abeokuta as their first and/or second choice(s) in the 2018/2019 UTME, and others who did not choose the Polytechnic but must have scored 120 and above in the UTME are to purchase cash/debit ATM cards from any bank of their choice and make a payment of Two Thousand Naira (₦2,000.00) only and then proceed to www.ogunpoly.edu.ng to complete application forms online. Read Also: MAPOLY post-UTME past Questions and Answers. Follow the process below to get the form. Candidates are to access the website and make an online payment using their debit ATM cards to the tune of Two Thousand Naira (NGN 2,000.00) Only. Click on “SUBMIT” to print your application form and screening slip. If you want us to get the form for you, scroll to the end of this post. Ogun Poly Post-UTME screening form will close on Tuesday 5th of September 2018. Interested candidates should hurry up and apply for the form now. Results of the screening exercise will be known to the candidates on the Polytechnic’s website. We are not affiliated, associated, authorized, endorsed by, or in any way officially connected with Moshood Abiola Polytechnic, or any of its subsidiaries or its affiliates. The official MAPOLY website can be found at www.ogunpoly.edu.ng The name “Ogunpoly” as well as related names, marks, emblems and images are registered trademarks of Ogun State Polytechnic. Please l had 194 in my jamb and I want to study mass comm.Hope I'm good to go?